Midsummer's Eve (or St. Hans) is celebrated by Norwegians on June 23rd (or on the nearest Saturday to that date). It is a celebration of summer and nature that traces its roots originally to pagan summer solstice rituals, and later to the birthday of St. John the baptist. Since Midsummer's Eve originates from pagan ritual, many of the current traditions relate to those ancient beliefs. Norwegians traditionally celebrate Midsummer's eve with bonfires. Originally meant to give added power to the sun and keep it on it's correct course, the bonfire today serves as a centerpiece for local and community celebrations and picnics. Along Norway's coastline, bonfires dot the shore with boats lining the river to see the fires and festivities. 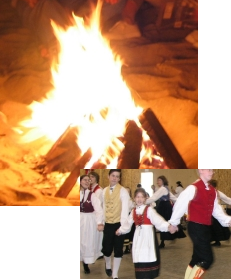 Many communities will build large bonfires for open air midsummer's eve festivals featuring music and entertainment, dancing, food vendors and local merchants. Norwegians decorate with birch twigs at the midsummer festivities -- a custom that started with the old Norse. The birch twigs symbolized the awakening of new life and nature, as well as peace.